I purchased this book from a list of you-may-also-likes in an online retail browser. I bought it because it was one of the few Christian fiction releases I could also find in an audio-book. This review is based on first listening to the book and then reviewing the hardcopy. It is the first book I have read by this author. Hints William Faulkner’s terse characterizations, tastes of Mark Twain’s dialects, and the distance of Flannery O’Connor couple in When the Mockingbird Sings to suggest a Southern literary narrative voice. The tells of Leah who sees and speaks to the Rainbow-man. She first sees him on her ninth birthday when the whole town is invited to the Leah’s house scarcely months after their father had moved the family from Camden to a dilapidated old Victorian mansion in the rural south. Another nine-year-old befriends shy, stuttering Leah and though no one else can see the Rainbow-Man, this friend, Allie, struggles to believe in the vision and likens him to Jesus, going so far as to Baptize the un-washed Leah in in an inflatable pool in Leah’s backyard late one summer night. It was one of the most charming scenes of the book and caused me to appreciate this author’s boldness and wit in a new light. The Rainbow-Man coaches Leah to paint beautiful renderings far beyond her talent that illustrate glory, and then, warn Mattingly of a terrible fate. One of the paintings magically bears the winning lottery numbers which ultimately disappear from the painting. A former town patron who is under extreme financial strain, plays the numbers and wins, but the money will not save is dying wife. The ruckus further divides the town. I have a weakness for well-defined setting where a town or community takes on a character. In this novel, Coffey turns the rural community of Mattingly into a single body, a flawed congregation with strict attention to doctrinal recipes, lovable in a way that a stubborn warrior is lovable when he cannot win but clings intractably to a bit of high ground – the cow standing on the manure pile. Mattingly shines as an allegory for the church and I couldn’t help but love her as the main character of this book, human scared and undiscerning. Coffey also draws vivid characters and does not force them into a personal agenda. The characters speak for themselves, each an ‘everyman’ with a recognizable traits and troubles. While the characters show their fears and weaknesses, the author’s hand is never so heavy as to mock his own creations. I’ve rated this book three stars because it is good, but just shy of an absolute keeper, meaning I probably won’t re-read it. While the language is occasionally poetic, the narrative voice is too harsh and the poetry is insufficient for this reader to make me we want to return to it. Overall the individual characters are so removed that I had trouble establishing a bond with anyone in the book. Most strongly I felt little for Rainbow-Man whom I so wanted to walk with. This brings me to my final point, that of the Rainbow-Man as Jesus. Rainbow-Man is so enigmatic and cryptic that I couldn’t relate. I never grasped the indwelling of the Holy Spirit in any character in the book and certainly never in the character of Mattingly the town. I understand the concept of prophetic vision and God’s sovereign use of the weakest among us in enacting His plans. The author seems to suggest that Leah is such a prophet, but I never quite reached the same conclusion. I would add that the cryptic portrayal of Rainbow-Man did cause me several hours of contemplation on how much we take for granted in our Sovereign, and how we often choose to dwell on His capacity as Comforter and Perfect Father rather than His almighty power. 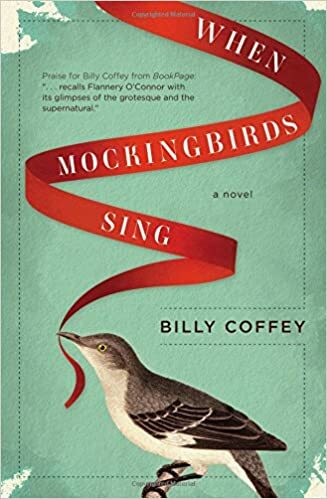 Pick up When the Mockingbird Sings for a refreshed take on corporate character in the town of Mattingly. Delve into it for an engaging story. Thank you for reading, Bev.